Greenways -- linear open spaces that preserve and restore nature in cities, suburbs, and rural areas -- are proving to be the most innovative land protection concept of the decade. Their diverse manifestations and wide variety of ecological, social, and economic values have made them the focus of planning for the future open space needs of Americans.This book provides professionals and citizen activists with the tools they need for developing a greenway plan. Topics covered include: the physical development of a greenway organizing community resources forging partnerships among public agencies, private groups, citizens, and businesses principles of ecological design, including wetland restoration, water quality, and wildlife issues The book offers general guidance for the overall process along with specific detail for each step along the way. 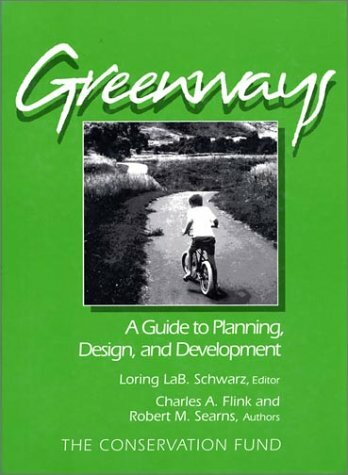 It is an invaluable source of information for professional and volunteer planners, with the recommendations, guidelines, warnings, and support needed for successful greenway development. Loring LaB. Schwarz is the former Director of State Greenways Planning for The Conservation Fund. Charles A. Flink, a leading national authority on the planning, design, and implementation of greenways, is a landscape architect based in Cary, North Carolina. Robert M. Searns is the owner of and urban design and planning firm based in Denver, Colorado. The Conservation Fund is a national 501c3 nonprofit organization dedicated to preserving America's land legacy by acquiring and protecting open space, wildlife habitat, and historic sites throughout the nation.